Reviews of good books, movies & TV shows, plus food & travel. Thursday this week - November 1 - I set aside my dark and creepy reading (that I thoroughly enjoyed the past two months in the RIP Challenge) and pulled a BIG stack of nonfiction off my TBR bookcase in preparation for Nonfiction November. 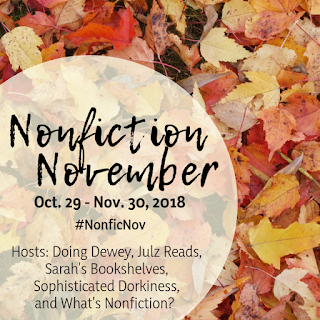 2018’s Nonfiction November is being hosted by Katie at Doing Dewey, Rennie at What’s Nonfiction?, Julie at Julz Reads, Kim at Sophisticated Dorkiness, and Sarah's Book Shelves. There doesn't seem to be a sign-up list, but you can read all about the events for the month, weekly topics for blog posts, an Instagram challenge, and more at Sarah's Book Shelves, and there will be link-ups each week. From the top, that's 1 autobiography, 7 memoirs, 3 narrative nonfiction, and 2 graphic memoirs/nonfiction. I forgot to include it in the photo, but I also plan to read The Lyme Solution: A 5-Part Plan to Fight the Inflammatory Auto-Immune Response and Beat Lyme Disease by Darin Ingels and Amy Myers, MD (my son has been fighting Lyme and two other tick infections for 10 years now). Seven: In the Lane of Hope since it was written by a friend, and I plan to start listening to Born a Crime for a read-along just as soon as I finish my last RIP audio book. I am off to a good start! The week's discussion topic for Nonfiction November is Your Year in Nonfiction So Far. Well, this will be a short discussion for me, since I have read almost all novels! That's actually more than I thought! Of these four, the one I liked best and recommend the most is definitely Killers of the Flower Moon, a powerful, moving, forgotten story from history about a horrific series of Osage murders and how the brand-new FBI eventually solved the case. It was absolutely fascinating, and my entire book group loved it (a rarity!). Since I read mostly fiction, I am excited for this month of exploring nonfiction (and making a dent in my TBR shelves, too). Are you participating in Nonfiction November? Any recommendations from among the books on my nonfiction TBR lists? I am participating in Non-fiction November, sort of. I keep forgetting about it, but feel like I am picking up non-fiction books so it's working. I need to see what the questions for this week are so that I can do a post. Your list looks great! ha ha that's what I did last year, Helen, so I decided to announce my intentions this year! You've got a great TBR there. I've read two - Almost French, many many years ago, I loved it of course, and Midnight in Garden of Good and Evil which I read so long ago that I don't really remember it. H is for Hawk and Born a Crime are both on my TBR too. Louise - I forgot to mention here that Midnight... has been on my TBR bookcase for about 20 years! lol I think it was actually new when I first got it. Glad to hear you enjoyed Almost French - my mom lent me that one. Hope you enjoy some NF this month, too! I've recommended Killers of the Flower Moon a lot too, especially to people who don't read a lot of nonfiction. The true crime aspect is so well done, it definitely has the feeling of a thriller in some parts. Brain on Fire is one of my favorites, good choices for your TBR! Yes, same here - it reads like a novel! Good to hear Brain on Fire is good, too. Quite a few new to me titles here - but it sounds like you have some great books to pick from this month. Good luck with nonfiction November, and happy reading! Thanks, Jade - I'm looking forward to it! I'm participating in NF November too, although with not very concrete plans to actually read NF this month. I've heard so many good things about Killers of the Flower Moon but somehow can't bring myself to read about real-life murders. Must try to analyze that! The history in Killers of the Flower Moon is just so fascinating! One of those stories from history that everyone should know about but no one does (or did before this book!) The part about how the FBI started is interesting, too. My husband is from Oklahoma, which is where all this happened, so that made it doubly interesting. I really enjoyed H is for Hawk—interesting book on a couple of levels. I am an Erik Larsen fan, as well as a John Berendt fan. Both of the books by these authors are excellent. Can;t wait to read H is for Hawk - I lost my dad 3 years ago, so it is very relevant to me. My husband and I both love Larson's novels, too! This is an interesting list of books to read. I have a nice list of non-fiction books I want to read as well. I think I'll share them on my blog today since I didn't even know this existed. :) This way you can see how much different our choices are in this category. The Seabiscuit movie is one of my favorites! I imagine the book will be even better. We are huge fans of Laura Hillenbrand, so I am way overdue for reading Seabiscuit! Wow, what a great selection you had on your shelves! I've somehow accumulated mostly fiction, so when I'm on a nonfiction kick, I end up doing a lot of reading library books and abandon the books I already own. Note: This blog contains affiliate links. Purchases from these links provide a small commission to me at no extra cost to you. It's Monday 11/26! What Are You Reading? It's Monday 11/19! What Are You Reading? It's Monday 11/12! What Are You Reading? It's Monday 11/5! What Are You Reading? Copyright 2017 Suzan L. Jackson. Simple theme. Theme images by Deejpilot. Powered by Blogger.